PETALING JAYA: Cesar Pelli, the architect of the Petronas Twin Towers, will once again be casting his magic on the 100-acre Kuala Lumpur City Centre (KLCC) site in a new development that is estimated to cost about RM2bil. Pelli is also involved in the design and architecture of retail and office block Lot C, to be completed next October. The 60-storey Lot C will be seamlessly integrated into the retail block of Suria KLCC, next to Mandarin Oriental Hotel. In this other development on Lot 185 and Lot 167/K, the world-renowned architect will be designing two additional towers of between 50 and 70 storeys next to the Twin Towers. The two blocks, an office tower and a hotel, will sit on a four-storey podium retail block that will be integrated with the present four-storey retail mall, Suria KLCC. 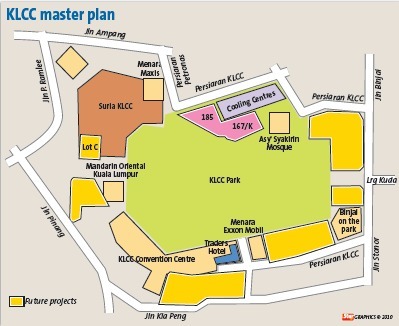 Hashim Wahir, the group chief executive officer of the KLCC Group of Companies said the development, sited on three acres, would be built on two adjacent plots. The Economic Planning Unit gave its go-ahead for the joint venture a few weeks ago, Hashim said. A detailed planning phase will be the next step and works are expected to begin by mid next year. This latest development, Hashim said, would be undertaken by KLCC (Holdings) Sdn Bhd in a 50:50 joint venture with the Qatari Investment Authority via QD Asia Pacific Ltd, a subsidiary of Qatari Diar Real Estate Investment Co, the investment arm of Qatari Investment Authority. “Lot C has one million sq ft of commercial space. It is being developed at a cost of RM1bil. This other development on two adjacent plots will have two million sq ft of commercial space. That will indicate how much this latest development will cost,” he said. Currently, the 100-acre KLCC development, of which half has been gazetted as the KLCC Park, has about 10 million sq ft of space in the Twin Towers, Suria KLCC, Menara Exxon Mobil, the Mandarin Oriental, Traders Hotel, the KLCC Convention Centre and Menara Maxis. All of them belong to the KLCC group of companies. The entire KLCC area is earmarked to have between 20 million and 22 million of commercial space. “These latest developments comprising the hotel and office tower blocks will complement and enhance the skyline. It will enhance the view for Binjai On The Park, our only residential development,” Hashim said. He said the latest development, together with Lot C, would help give a new shopping experience to the more than four million visitors who throng the Suria KLCC. A plaza connects Suria KLCC with this new retail podium block in Lot 185 and Lot 167. “There is a demand from retailers for space,” Hashim said. Within the next five to seven years, other developments will be coming up behind Traders Hotel and in other parcels of land on both sides of Binjai On The Park. “As we complete these different components that make up the KLCC development, we believe the value of Binjai On the Park will move up because new amenities and conveniences are being added. “Binjai is the first residential property on the park. We are working to provide delivery service from the supermarkets from Suria KLCC; our residents have access to all the services that Mandarin Oriental guests enjoy and we also have the Prince Court Medical Centre to provide medical services for residents,” he said. More than 95% of Tower B of Binjai On the Park has been sold. What remains are the larger standard units in both towers and the 19,000-sq-ft triplex penthouse in Tower A. “As our master plan unfolds, the value of our projects on these 100 acres will continue to be enhanced. One Hyde Park (a high-rise residential development) in London only has the park. “We have the park and many other components that have proven to be synergistic both in terms of physical amenities and services, all in one single iconic development, with a commanding skyline,” Hashim said. Bina Puri Holdings Bhd will team up with Medini Land Sdn Bhd, a unit of Iskandar Investment Bhd, to develop the Medini Square project, which has a gross development value of RM500 million, in Iskandar Malaysia. In a joint statement today, the companies said the project, which would be undertaken via a joint venture company, Medini Square Sdn Bhd, would comprise retail, shop offices, small office/home office (SOHO) units and an office tower. "The 1,048 million sq ft gross floor area development will complement the other attractions in Medini North, including LEGOLAND Malaysia," the statement said. It said the first phase of the Medini Square would be completed by mid-2011 with approximately 50 shop offices developed, while phase two would see a combination of a SOHO concept and office tower. The statement said the Medini Square Sdn Bhd would enjoy fiscal and non-fiscal incentives under the initial incentives and support package for early investment into Iskandar Malaysia. "The incentives include corporate tax exemptions for 10 years," it said. The proposal to impose a 80 per cent loan-to-value ratio (LVR) for mortgages will not dampen the property market in the long run, said Minister of Housing and Local Government, Datuk Wira Chor Chee Heung. Nevertheless, Chor said, there was a need for a certain structure to ensure it would not be a burden for the lower-income group to own a house. "To enable the lower-income group to purchase house, perhaps there could be some kind structures where buyers who want to buy RM500,000 house and below, can still get 90 per cent loans while those who want to buy a house exceeding RM500,000, they can be given a 80 per cent loan," he told reporters after visiting Zephyr Point, an example of build-then-sell project here today. "I leave it to Bank Negara Malaysia (BNM) to decide the best course but in the long run, I don''t think the 20-80 per cent will dampen the property market as such because today a large percentage of the purchases are made by genuine buyers. They need a home, that is why they are buying," he said. Chor was responded to a question whether the proposal to impose 80 per cent loan for home buyers would dampen the property market as the move was likely to be implemented to cushion the risk of property bubble. Recently, BNM was reported to be in discussion with banks on possible moves to curb speculation on property prices. It was reported that the possible measures, which would likely to include the 80 per cent LVR for mortgages, are believed to be targeted at the high-end and non-owner-occupied house purchasers. Meanwhile, Chor said, the ministry was seriously looking for partners to revive the current 47 abandoned housing projects as soon as possible. He said the government has allocated about RM200 million to help developers revive these abandoned projects. "It is not easy for developers to come in and help. "(However), if there is virtually nothing to be made from reviving these abandoned project, the fund can be use as compensation for these developers," he said. PETALING JAYA: The impact of any lower loan-to-value ratio (LVR) for mortgages on the banking system loans growth is still unclear, but analysts do expect loans growth to take a hit if the measure is pushed through. Kenanga Research, in a report, said if measures to cool the property market were implemented, a move that is being studied by Bank Negara, there could be a negative impact on mortgage applications. The research house said that the consumer segment was still “the sole driver for banking system loans growth” based on Bank Negara’s monthly statistical bulletin for July. It said there were signs of a slowing down in loans growth, with growth in the business segment unsustainable compared to the strong performance earlier in the year. “Going forward, we’re cautiously optimistic about the outlook of loans growth from the business segment with the easing of the business loan momentum,” it said. It was reported last month that the central bank was exploring possible measures to curb excessive speculation on property prices by having a cap on the LVR to 80% from 90%. TA Securities Holdings Bhd analyst Wong Li Hsia told StarBiz that the impact to loans growth would really depend on the manner of implementation. “There will likely be an impact but we don’t know at this point how serious it will be as Bank Negara has yet to issue any guidelines on how it’ll be implemented,” she said. According to other analysts, preemptive measures would only have a temporary effect on speculation as buoyant consumer sentiment and demand for good locations were expected to sustain property prices. They said based on last October’s imposition of the 5% property gains tax, there could be a “short-term knee-jerk reaction” where demand cooled off for a while and property buyers became more discerning. CIMB Investment Bank Bhd research head Terence Wong had suggested in an earlier report that should the measure be implemented, it should be on landed residential properties where prices have surged in certain locations instead of across the board. However, HwangDBS Vickers Research analyst Yee Mei Hui said in a note yesterday that blanket measures were unlikely to be imposed given the differing level of speculation in the various segments of the property market. “We believe first-time and mass residential buyers may be spared (similar to regional markets),” she said, adding that properties below RM500,000 constituted 94% of last year’s transaction volume and 68% of value.